We are grateful for Rosa Latimer’s support of the Slaton Harvey House by serving on it’s board and providing wonderful ideas, offering illuminating stories for your reading pleasure. The year: 1913. The place: a Harvey House in the tiny New Mexico town of Rincon. The event was the wedding of a young nurse from Philadelphia to a handsome Frenchman from the island of Mauritius in the Indian Ocean. Given the limited travel opportunities of the time and inadequate long-distance communication (a century before Face Book!) how did this improbable union take place? Two words: Fred Harvey. Although generally Harvey rules banned Harvey Girls from dating Santa Fe men, even the mighty Fred Harvey couldn’t stop love! 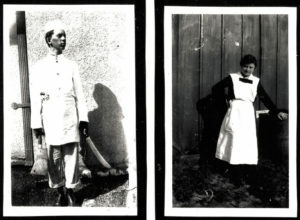 Joe Fondy worked as a cook at the Slaton Harvey House cook until he was old enough to work for the Santa Fe Railroad. On his runs to Sweetwater he met Harvey Girl Ethel Reeves. The family history tells us that when Ethel first saw Joe enter the Harvey House she declared that he was the best looking man she had ever seen and she intended to marry him. The wedding soon followed. The bride, Gertrude McCormick and the groom, William Alexander Balmanno, were my grandparents. This very personal, true story set me on a path to pay tribute to the thousands of women who truly civilized the West – Harvey Girls. Gertrude was an orphan who had finished nursing school in Philadelphia and after working a while, decided she wanted to go to Alaska. In early 1912 this would not be an easy accomplishment for a young single woman. Gertrude learned that Fred Harvey was hiring “educated women of good character” to work in his restaurants that stretched from Kansas across the Southwest to California. She recognized an opportunity to work her way toward Alaska, interviewed to be a Harvey Girl and promptly boarded a train to Rincon, New Mexico. I can only imagine the culture shock of leaving a city the size of Philadelphia and landing in this small railroad town in southern New Mexico. However, it wasn’t long before excitement entered Gertrude’s life when a tall, dark and very handsome young Frenchman came to town. At the age of twelve William left his family on the island of Mauritius to work on whaling ships. Seventeen years later, he and a friend quit their whaling jobs in Vera Cruz, Mexico, and decided to walk to California. On the way, in Rincon, New Mexico, William took a job with the Santa Fe Railroad to earn money to finish his trip. The lunch counter in this small Harvey House seated twenty-six, and there was no dining room. Most likely no more than six Harvey Girls worked in Rincon at any one time. The new railroad man who spoke with a heavy French accent must have caused quite a stir. Petite Gertrude caught his attention, and three months later, William and Gertrude married. They spent the rest of their lives in New Mexico, and William worked for the Santa Fe until his retirement. 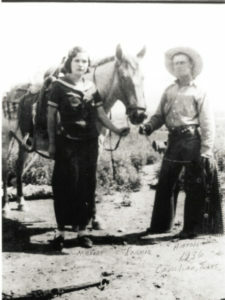 Maxine Cockrell started working at the Canadian, Texas Harvey House at age 15 when she was hired as a “salad girl” in the kitchen. Once she turned 18 years old she began her Harvey Girl duties at the lunch counter. There she met a local cowboy, Harold Wilson and after courting a few months the couple married and sold Harold’s horse to provide funds for a move to California. However, they soon returned to Texas so their first child would be born in their native state. Of course this is just one Harvey Girl love story. In my writing I focus on personal Harvey Girl stories: the life situation that drew them away from home; the interesting and diverse people who crossed their paths and how these young women changed the culture of the west and southwest in so many ways. You can find all of this in my series of books: Harvey Houses of Texas, Harvey Houses of New Mexico and Harvey Houses of Kansas all published by The History Press and available wherever books are sold. You can also enjoy the light-hearted, nostalgic story of Gertrude and other Harvey Girls in upcoming live performances of the play “Harvey Girls” performed in a dinner theater setting at the Slaton Harvey House. Performances are Friday, September 30 & Saturday, October 1, 2016 at 6:000 p.m. Tickets are $30/person (dinner and play) and reservations are required as seating is limited. For more information or to make your reservations, email slatonharveyhouse@gmail.com or call 806-828-5900. Please join me for a truly enjoyable evening that will also serve as a fundraiser for the Harvey House along with the Slaton ISD and Post ISD theater departments.